James Edwin Hinshaw1,5 [James Edward Hinshaw6]. Born Feb 2 18811,3,5,6 [about 18822,4], Randolph County, North Carolina1,3,5,6. 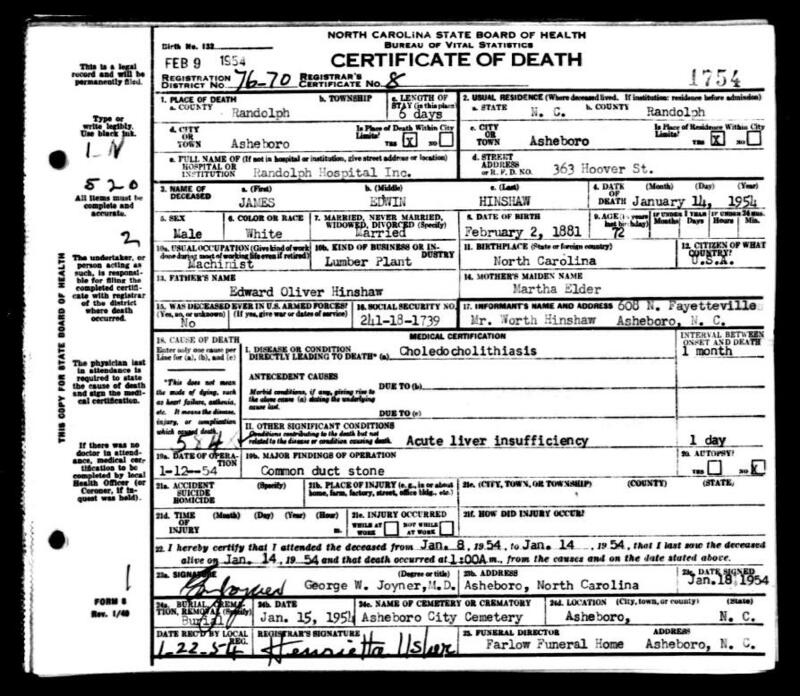 Hinshaw, James, head-of-household, age 28, born in North Carolina; parents born in North Carolina; first marriage, married 4 years; occupation: foreman, [..unclear..] lumber co.; rented home. Hinshaw, Minnie, wife, age 25, born in North Carolina; parents born in North Carolina; first marriage, married 4 years; 2 children, 2 living. Hinshaw, Worth, son, age 3, born in North Carolina; parents born in North Carolina. Hinshaw, Virginia, daughter, age 3 months, born in North Carolina; parents born in North Carolina. Redding, Mosell, boarder, age 16, born in North Carolina; parents born in North Carolina; attended school. Hinshaw, James, head-of-household, age 39, born in North Carolina; parents born in North Carolina; owned home (free); occupation: cabinet maker, coffin factory. Hinshaw, Minnie, wife, age 35, born in North Carolina; parents born in North Carolina. Hinshaw, Worth, son, age 13, born in North Carolina; parents born in North Carolina; attended school. Hinshaw, Thelma, daughter, age 8, born in North Carolina; parents born in North Carolina; attended school. Stewart, Mozelle, boarder, age 25, born in North Carolina; parents born in North Carolina; married. Stewart, Harry, son, age 5, born in North Carolina; parents born in North Carolina. 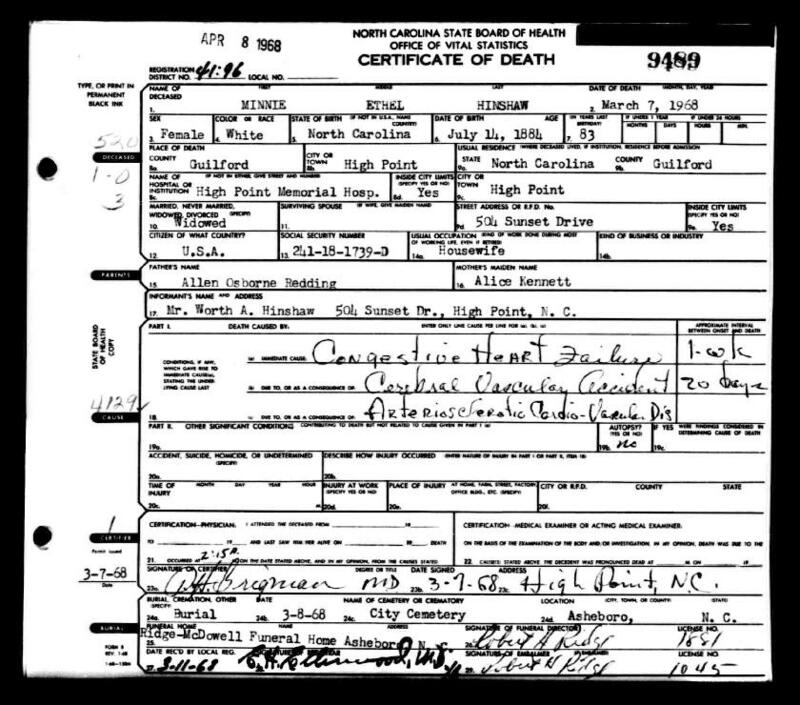 Hinshaw, J.E., head-of-household, age 48, born in North Carolina; parents born in North Carolina; first married at age 24; owned home ($1500 value); radio in home; occupation: mechanic, lumber plant; not a war veteran. Hinshaw, Minnie, wife, age 45, born in North Carolina; parents born in North Carolina; first married at age 21. Hinshaw, Worth [unclear], son, age 23, born in North Carolina; parents born in North Carolina; single; occupation: knits, hosiery mill. RootsWeb WorldConnect data by Ralph Bulla (). 1910 census, Asheboro, Randolph County, North Carolina; roll T624-1128, ED 76, page 11A, line #34, dwelling #200, family #212. 1920 census, Asheboro, Randolph County, North Carolina; roll T625-1318, ED 96, page 5B, line #90, dwelling #100, family #102. 1930 census, Asheboro, Randolph County, North Carolina; roll T626-1714, ED 1, page 4A, line #13, dwelling #63, family #73. 1910 census, Asheboro, Randolph County, North Carolina; roll T624-1128, ED 76, page 11A, line #39, dwelling #201, family #213.